One of the things to love about Winter is that it is citrus season. Oranges, lemons, tangerines and blood oranges brighten the produce aisles of the supermarkets. I usually have an orange for breakfast. 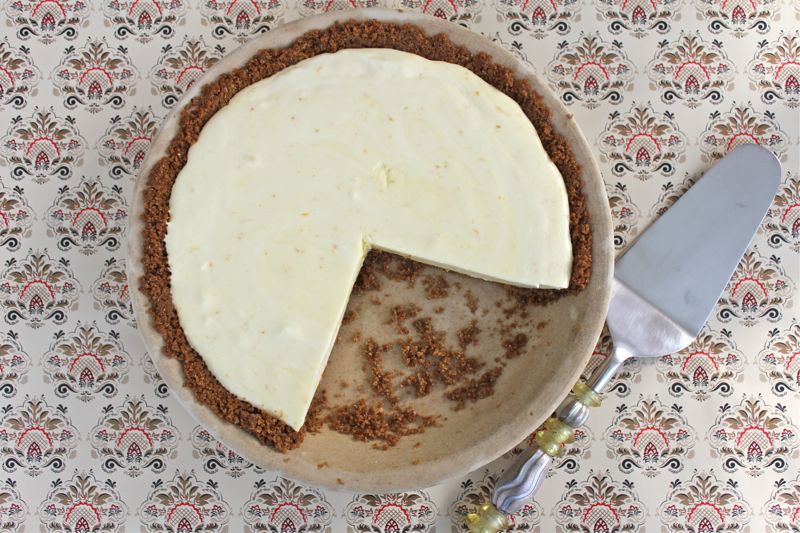 But for a bit more decadent way to enjoy citrus try this smooth chiffon pie with a bite from the gingersnap crust. It brightens even the most gloomy of days. We are beginning a kitchen project this week. We have been slowly updating what we found when we bought the house in Florida. 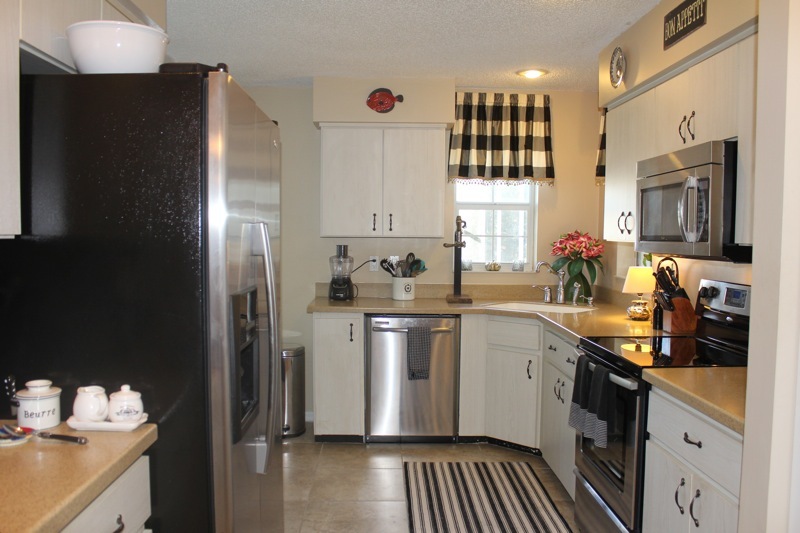 We updated the appliances a few years ago and added new countertops. 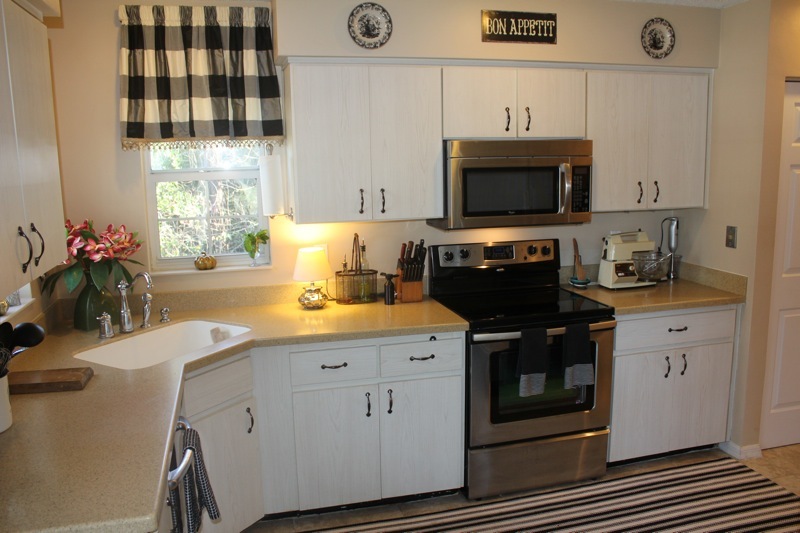 The previous countertops were the same faux wood as our cabinets. Not pretty. We chose Corian. 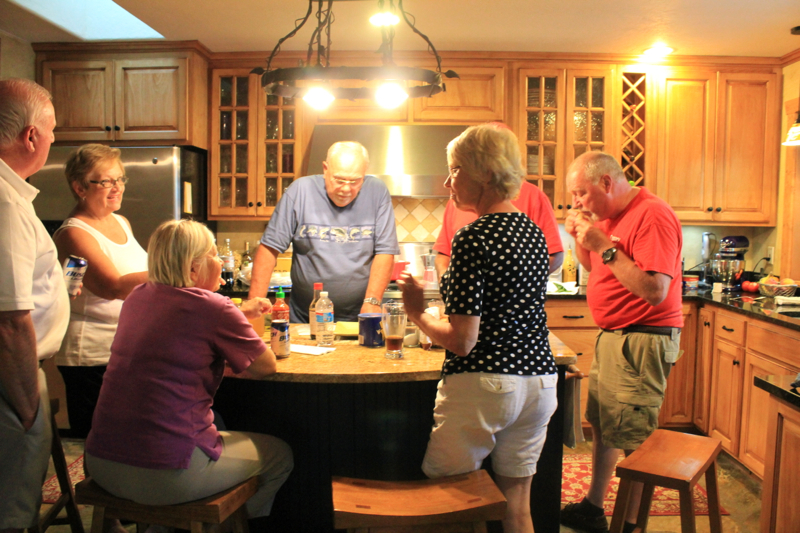 We have granite in Lake Lure, but Corian seemed the right choice for Florida. Our current project is to reface all of our kitchen cabinets, replacing the doors and adding a few pull out shelves. Here is how the kitchen looks now. The new cabinets will be off white, creamier than what you see here. The style is Shaker with a beadboard insert. The installers will be here Thursday and Friday and should be able to finish the job in just those two days. The cabinet over the dishwasher will have glass doors. I am anxious to see the results. I will give you an update when it is all put back together again. In the meantime, I will be making a pot of soup before the work begins. I was told that we could still use the kitchen and it made sense to have soup in the fridge to reheat for dinner each night. 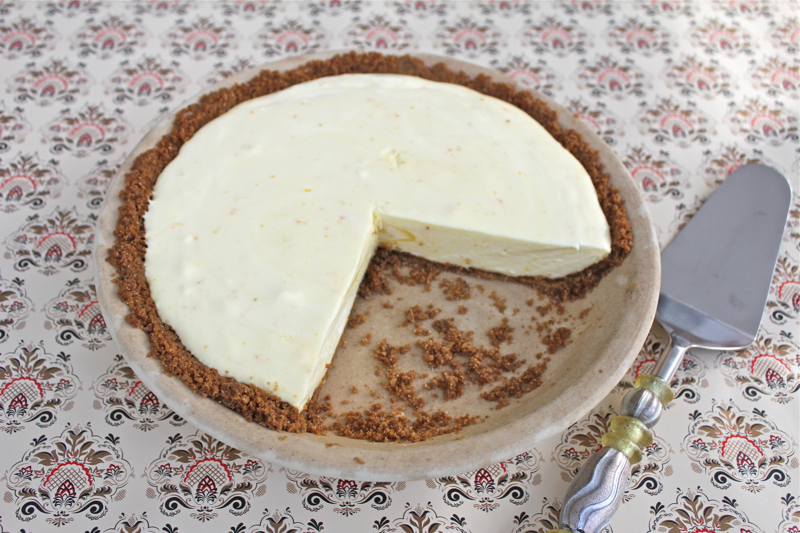 I will also have this tart lemony pie with a hint of orange zest to dig into. I plan to add this to my list of Florida desserts. I usually make key lime pie for guests, but this lemon chiffon pie is a good alternative. By the way, the background for my pie is a Downton Abbey wrapping paper available at World Market. I was immediately attracted to it before I even knew its provenance. This year’s episodes of Downton Abbey are riveting. What will happen to Mr. Bates? Will Lady Mary find happiness? Preheat the oven to 350 degrees F. In a bowl, stir together the crumbs, butter, and 3 tablespoons granulated sugar until the crumbs are evenly moistened. Pat the crumb mixture firmly and evenly into the bottom and all the way up the sides of a 9-inch pie pan or dish. Bake until the crust is firm, 5-7 minutes. Pour 1/4 cup cold water into a saucepan and sprinkle with the gelatin. Let stand until the gelatin softens and swells, 5-10 minutes. Stir in the 3/4 cup granulated sugar, salt, lemon juice, orange zest, and egg yolks; the mixture will be lumpy. Cook over medium heat, stirring continuously, until the gelatin melts and the mixture thickens, 6-8 minutes. Do not allow the mixture to boil. Set the saucepan in an ice bath until the mixture is cool to the touch. In a large bowl, using an electric mixer, whip the cream and confectioners’ sugar on medium-high speed until thick, soft peaks form. Spoon the whipped cream into the gelatin mixture and fold together with a rubber spatula until smooth. Pour into the prepared crust, smoothing the top. Refrigerate the pie until chilled and firm, 3-4 hours. Let stand at room temperature for 20 minutes before serving. Posted on January 13, 2015 at 7:38 pm. We have been busy with friends recently. Our Michigan and Nantucket friends were here for a visit. We had a wonderful time with them. One of our Michigan friends is a fruit farmer and he has acres of apple orchards. 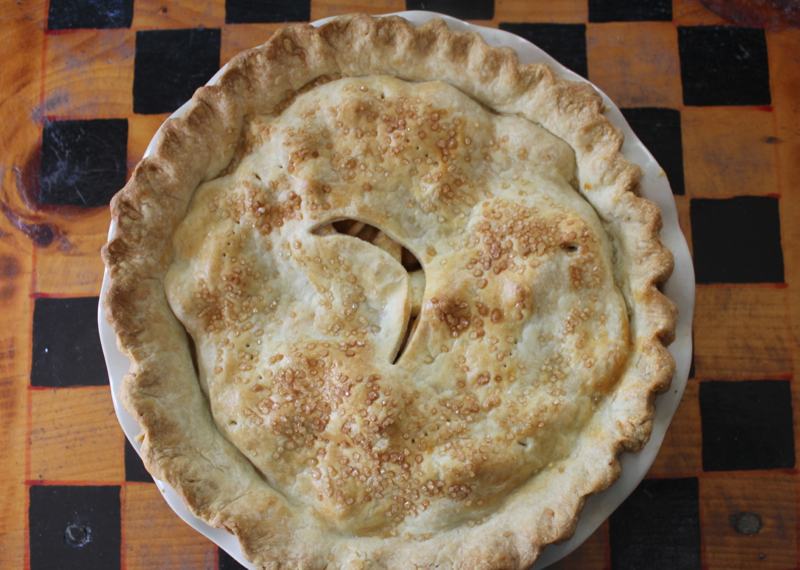 So it made sense to me that I had to make an apple pie. David said “You are probably going out on a limb here because Jim is probably a connoisseur of apple pies”. Since I love to live on the edge, I decided to make Ina Garten’s deep dish apple pie because you can’t go wrong with her recipes. The pastry recipe was very easy to work with. It had a combination of butter and shortening in it and rolled out like a breeze. The apple filling was good, but Jim did notice the lemon flavor added to the apples. I think it was too much and took away from the cinnamon flavor. 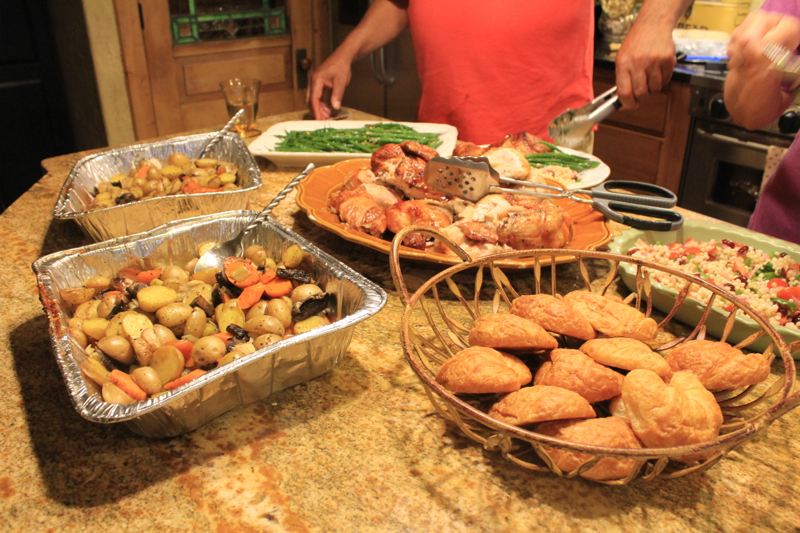 Another meal that we had was rotisserie chicken on the grill with potatoes, onions and carrots roasted underneath them. I got the recipe from the other Penny at The Comforts of Home. It was a challenge to get three whole chickens on the spit, but David managed it and they turned out very well; moist and crispy. I served them with French green beans, croissants and salad. Very French. Moses, our Nantucket friend, even cooked the necks and gizzards to be nibbled as an appetizer. I think David was really enjoying the neck meat. Every picture that I took showed him gnawing away. My kitchen looked messy, but I wouldn’t have it any other way. 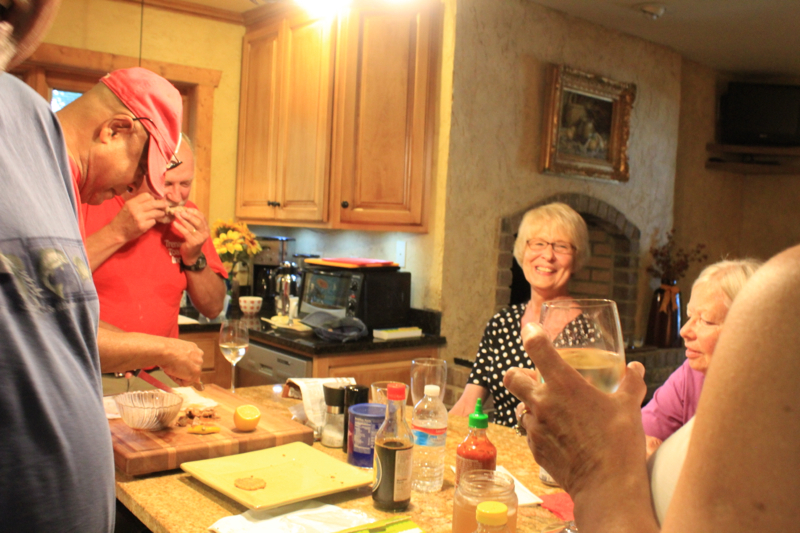 Smiling faces, good friends, good wine and good food all conspired to make for a memorable get together. 1 egg beaten with 1 tablespoon water, for egg washPreheat the oven to 400 degrees F.
Dice the butter and return it to the refrigerator while you prepare the flour mixture. Place the flour, salt, and sugar in the bowl of a food processor fitted with a steel blade and pulse a few times to mix. Add the butter and shortening. Pulse 8 to 12 times, until the butter is the size of peas. With the machine running, pour the ice water down the feed tube and pulse the machine until the dough begins to form a ball. Dump out on a floured board and roll into a ball. Wrap in plastic wrap and refrigerate for 30 minutes. Posted on September 11, 2014 at 2:23 pm. Cherry pie has been on my mind lately. We had a wonderful cherry pie at The Inn on Crippen Creek Farm on our vacation. My friend Lyla commented on the fact that I failed to get the recipe for it and drats, it is true. While shopping the other day I picked up some sweet cherries with the intention of baking a pie. While laboriously pitting the cherries yesterday David said “what are you going to do with them?” I said “make a pie”. He said “You can’t make a cherry pie with sweet cherries!” “What!” I said. You have to understand that I trust what he is saying, in this case, because he grew up on a farm. A fruit farm. With cherry trees. His Mom was a great cook. Their cherries were sour. Grumbling, I went to the internet and searched for recipes for sweet cherry pie if there were such things. I found one and it was from Deb at Smitten Kitchen. If you can’t trust her authority, one who is under contract with Knopf for a cookbook coming out next Spring, who can you trust. So there. As I expected when making a cherry pie with sweet cherries, just use less sugar. I feel pretty confident about pie crust. Even back in high school when I didn’t know how to cook anything else, I knew how to make a pie. I had grown up watching my Mom and Grandma make pies. 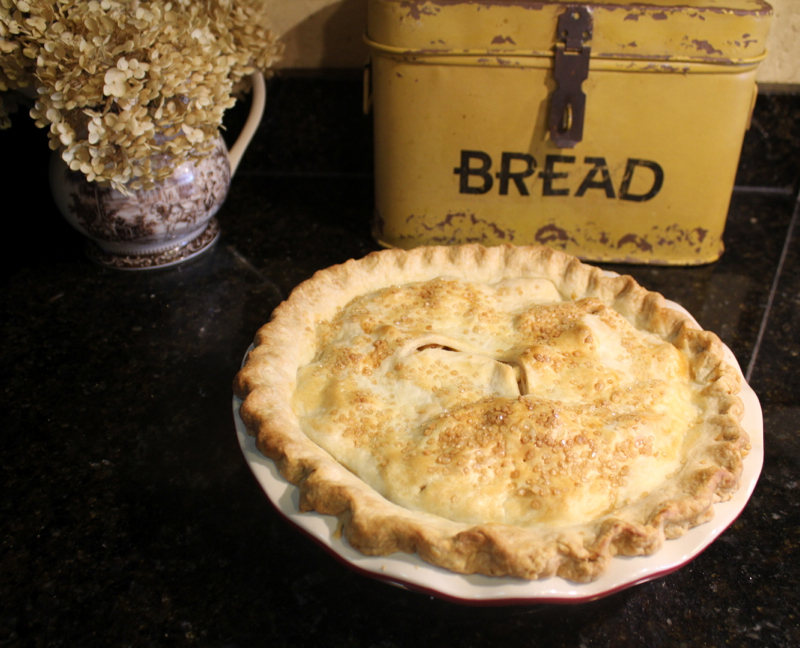 As a matter of fact when David and I were first dating I decided to impress him with a homemade apple pie. I worked on it all afternoon taking extra care to flute the edges of the crust just so. David picked me up for out date and we went to a movie. Now you have to understand that there were two people in our family who loved pie crust; my Dad and me. While we were gone, my Dad started nibbling on the edges of the pie by breaking off small pieces, a little here a little there. He couldn’t help himself. By the time we got home, my beautiful pie looked like a family of mice had gnawed their way through the edges leaving crumbs of pastry scattered everywhere. It was a disaster. David laughed. I was furious. Later my Dad apologized, but it was not as heartfelt as I thought it should have been. He thought it was the funniest thing that he had ever done and over the years the story was told over and over again with great mirth. So to this day, when I make a pie, I always make it with a thick crust with the edges fluted just so. Just for Dad. For the recipe for sweet cherry pie and a really great all butter pie crust check out Deb’s Smitten Kitchen blog post. Posted on July 15, 2011 at 9:55 am.